The point I get from this story is that the nature of the scorpion is to sting. No matter what the scorpion says, or even wants itself, it cannot fight its own nature. In this story the Scorpion is my sister. There is a tendency to attribute Tenley’s issues to her addictions but when you strip them away she is still the same. She says and does the same things. She in fact understands how people react to her when you talk about rehab. She can convince you to write off what she said, the craziness you just went through, to her addictions. She can blame the drugs, in turn keeping the blame off herself. This fable has always helped me to deal with Scorpion because it always reminded me that no matter what I do, no matter how much I extend myself I will get stung. I always have and always will. Even when she had me convinced that she had gone through rehab and come out OK. When she said “back when i was mean” I actually thought she understood what she meant. But in reality she was only repeating what she had heard in rehab and sober living. She was just reflecting back, like she always has, on what others were saying. After all, she is just doing what she does. The fable also points out that the scorpion is predictable. If you can just remember the scorpion is just a scorpion you can predict when the next sting is coming and get out of the way. 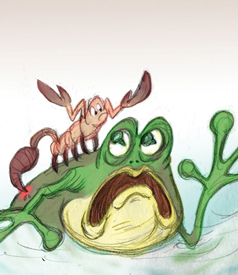 What has always been so compelling to me about the fable is the fact that I am the frog. The fact that time after time I let the scorpion talk me into taking that trip together. I ignored my own instincts and let myself be talked into things that I never should have let happen. I always forgot about the fable. When it happens I go through such a hard time because I end up feeling so violated. But the only person I have to blame for it is myself. I let myself walk into it over and over and over. Like that poor little frog. Because in reality what crossing the river meant for me, was that a smooth ride and successful landing on the other side meant some kind of normalcy with Scorpion. Something my friends had with their siblings. Something i always admired and found myself jealous of. Because I grew up with the two of them I became a people pleaser. This set me up to always fall for her games. After all as a people pleaser you think more about what you can do to make the other person comfortable and less about protecting yourself. I had to come up with some way to remember the fable if I was ever going to break that pattern. I had to create a trigger for me to remember that trusting the scorpion will surely get me stung. So I did the easiest thing I could and just started calling her Scorpion. Now that I have internally changed her name to Scorpion I always find her predictable because I am always thinking from the right frame of mind. I am not the same frog that used to just go along.